In a foreign land, food and transport are the biggest challenges for most travellers. 94% of Pickyourtrail’s travellers cite easy access to public transport as key criteria for choosing hotel locations. When I reflect on my own vacations, the ones I enjoyed the most had public transport deeply linked to it. It gives you a certain sense of freedom and security that catapults the overall enjoyment score to a different level. The city of love reverberates with a striking sense of fashion and culture. Love is in the air and the buzz is real in Paris. But literally beneath all the fuss is the dense metro system of Paris. Operating every day since 1990, the metro in Paris is the second busiest in Europe with 4.16 million people (that’s almost the entire country of New Zealand on a metro) riding it across 302 stations. (Delhi metro has 229 stops). The term ‘metro’ is derived from Compagnie du chemin de fer métropolitain de Paris, the company that built and operates Paris metro. 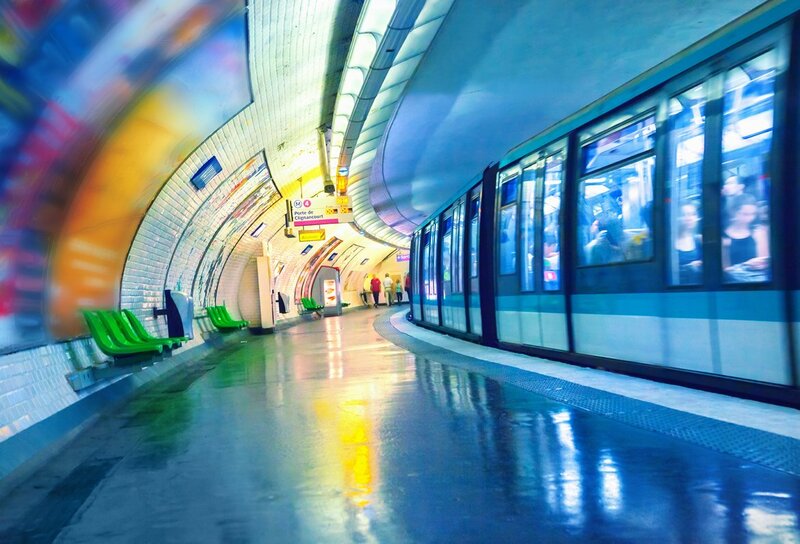 It is said that there is not a single place in Paris which doesn’t have a metro station in 500 metres reach. The Arts et Métiers station in the Paris metro was redesigned in 1994 in a steampunk style by comic book artist François Schuiten. The grounds of the metro system was used as the discussion spot for the French resistance during World War II. When it comes to engineering and innovation, there’s no better country than Japan. 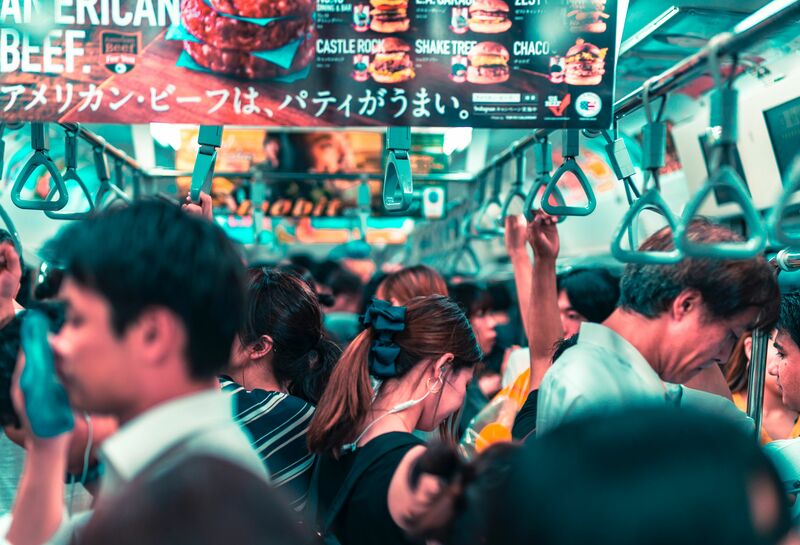 The Tokyo metro is yet another gem from the land of the rising sun. The city has two subway operators: Tokyo Metro & Toei and they are best used in tandem. 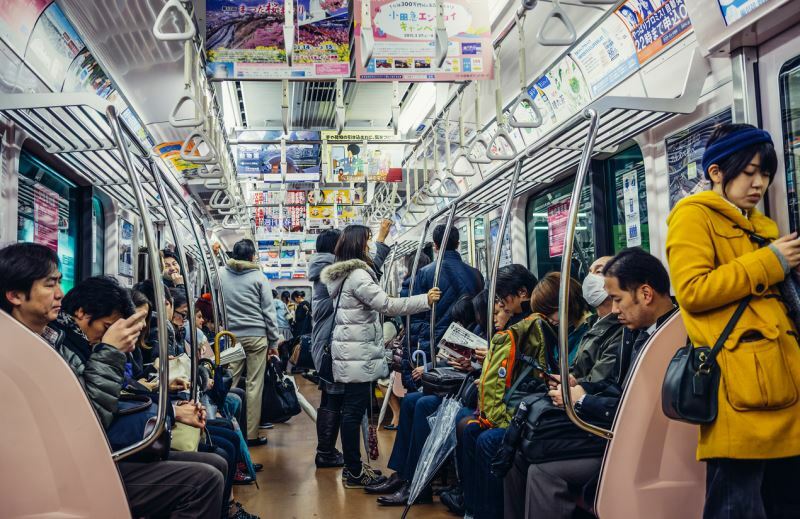 Over 6.84 million people use the Tokyo metro daily and it is one of the best & also the busiest in the world. Take a look at the Tokyo metro map and you will most likely mistake it for a complicated riddle. Almost all the stations in Japan have a unique jingle that plays marking the imminent departure of the train. Composed by the famous Minoru Mukaiya, the jingles are of 7 secs and convey a unique story. There is little to no noise inside the car as the Japanese respect privacy and almost everyone is streaming live tv on their smartphones. During peak hours, white-gloved attendants (pusher or oshiya) shove you and your belongings into the train. Most of the stations also have railings in braille and raised yellow rubber strips to guide the disabled. Inside the station escalators, people stand on the left and walk on the right. Those taking the stairs or walking, always follow the arrows. 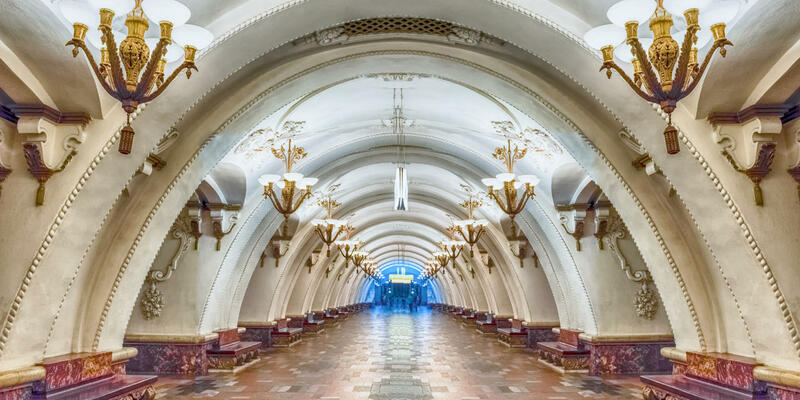 If you think just the attractions in Moscow are artistic with a splash of history, then you are wrong. 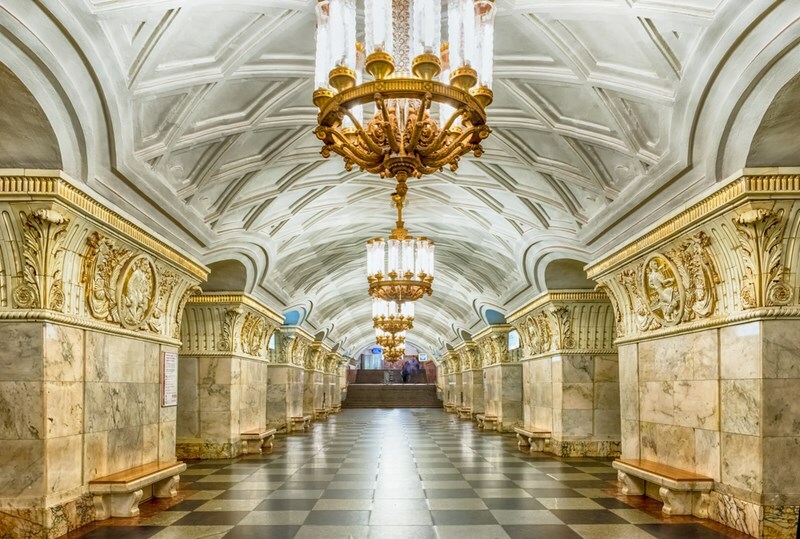 The Moscow metro is a classic example. Complete with chandeliers, mosaic artworks, and bronze status, the opulence on offer is inviting. The idea was that the aristocrats wanted to give the locals a flavor of the opulence and make them feel inclusive and hence these metros were constructed at a grandeur like none other. 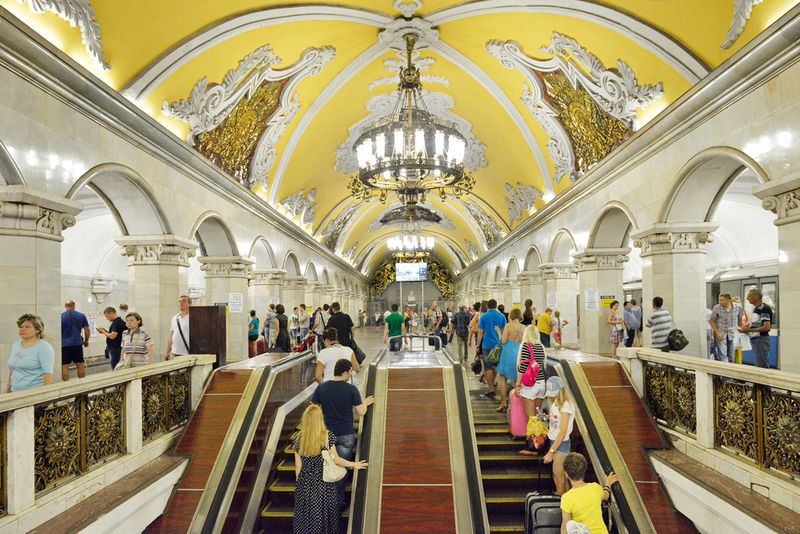 Given there were larger state motives, each station in Moscow is designed in accordance with the particular era and the political leader in mind. So, riding the metro in Moscow is like diving right into the Russian history book. Dress up in your finest and you will also experience the artsy gallery vibe which throws light on the grand baroque past of Russia. In 2007, Watercolor train called the Aquarelle was introduced. It offers a museum-like experience with paintings decorating the inside and watercolors on the outside. Male voice announcements in the train signify that you are headed into the city. Female voice means the train is heading out of the city. 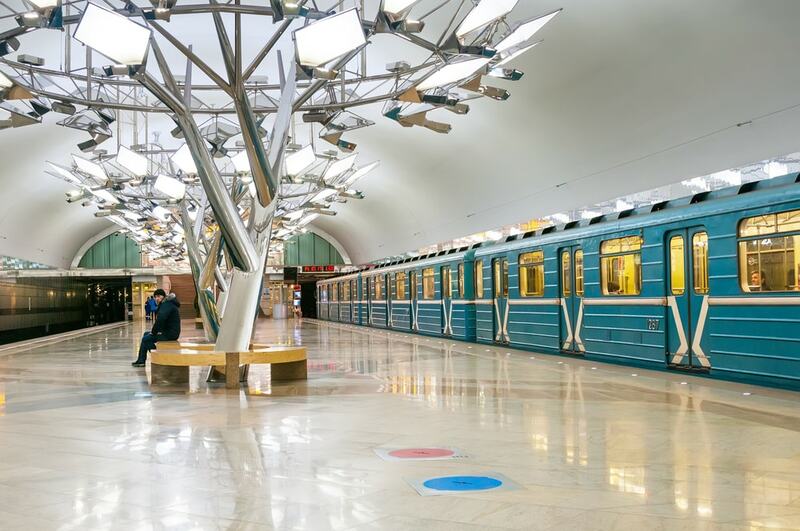 Moscow has three themed trains apart from Aquarelle – Reading, Poetry, and Retro train. 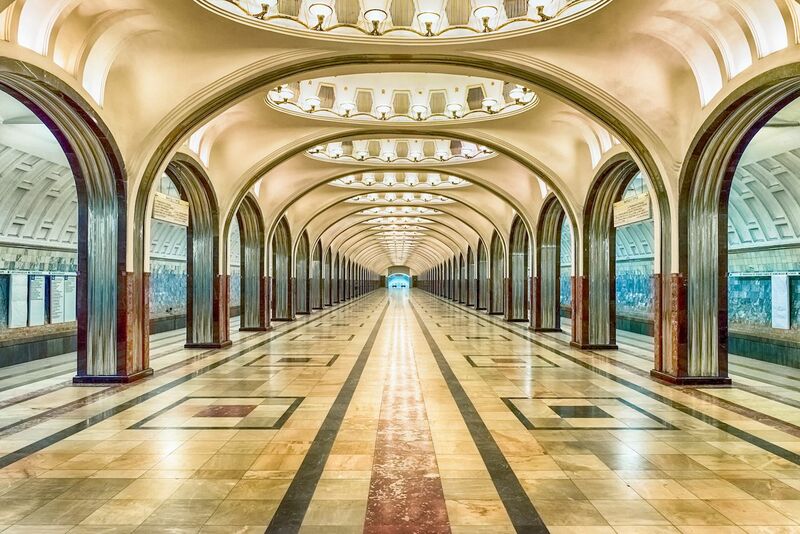 Moscow subway was used as bombproof shelter during World war II airstrikes. Some stations even served as hospitals during the time. Out of all the destinations, London has more claim to be mentioned in this article. Want to know why? London has the oldest metro system in the world. Operating since 1863, it is also the world’s first underground railway system. 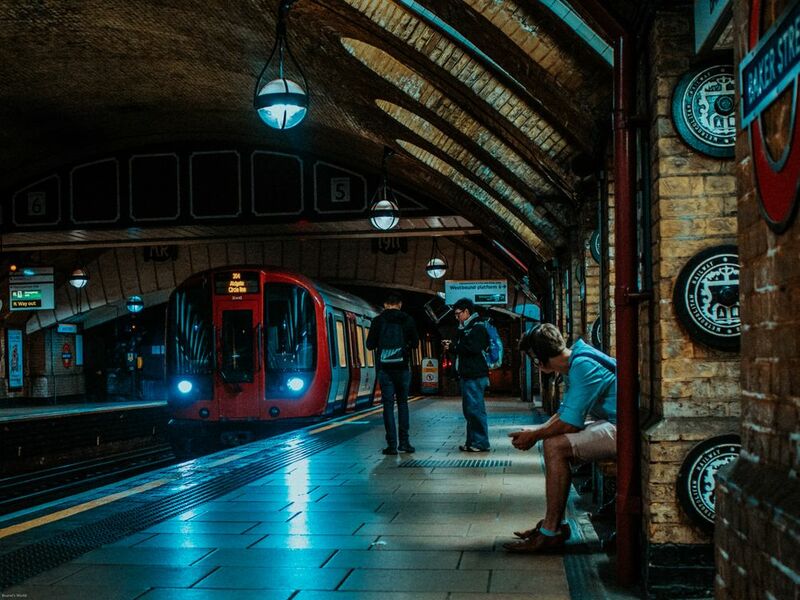 Uniquely designed with rounded tunnels, the metro system in London is referred to as the ‘tube’. 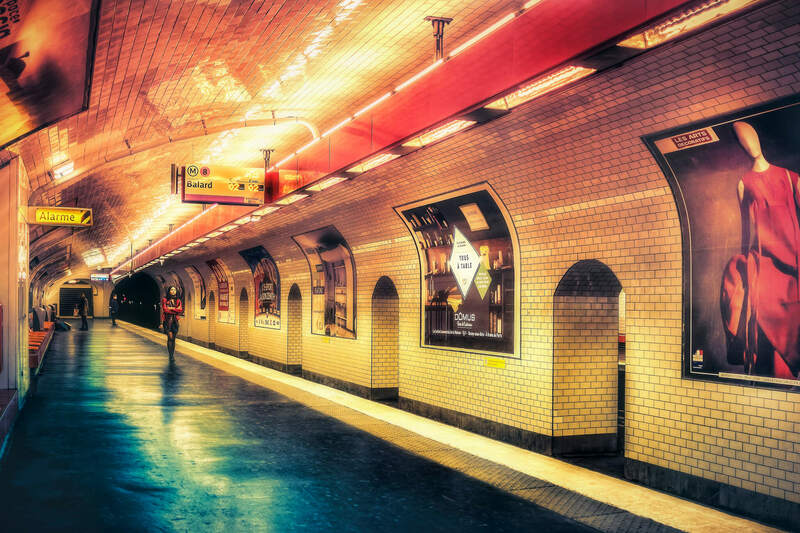 There are a total of 270 stations serving an approximate 5 million people every day. 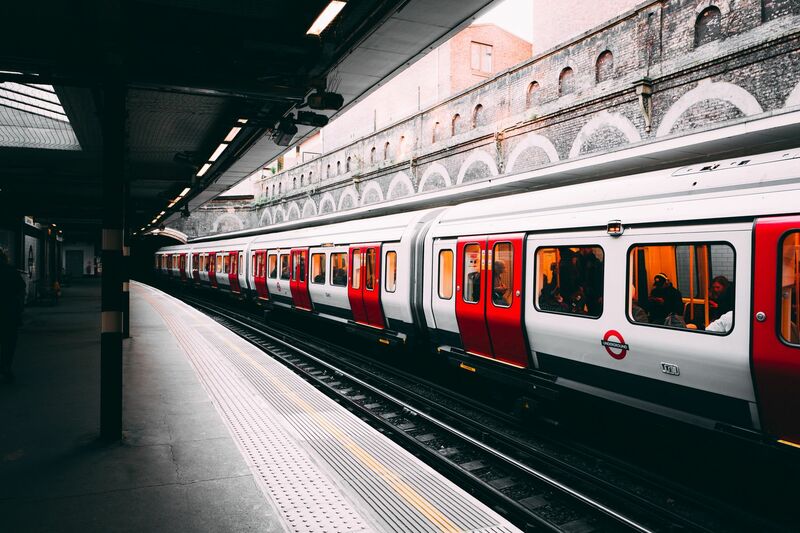 There are a number of notable people who have ridden the tube in London. Queen Elizabeth II and Mark Twain to name a few. There is a unique type of mosquito called Culex Molestus, which is referred to as the London Underground Mosquito. This is because the mosquito was first discovered in the underground during World War II. Every day, 47 million litres of water is pumped out from the tube. Welcome to the city that never sleeps. Dazzling with lights, late-night parties, and fashion, New York is synonym with energy. A derivative of the same nature is the city’s metro. And the New York subway needs no introduction as you would have seen it in every English movie or series. Yes, it is an inseparable part of the city. 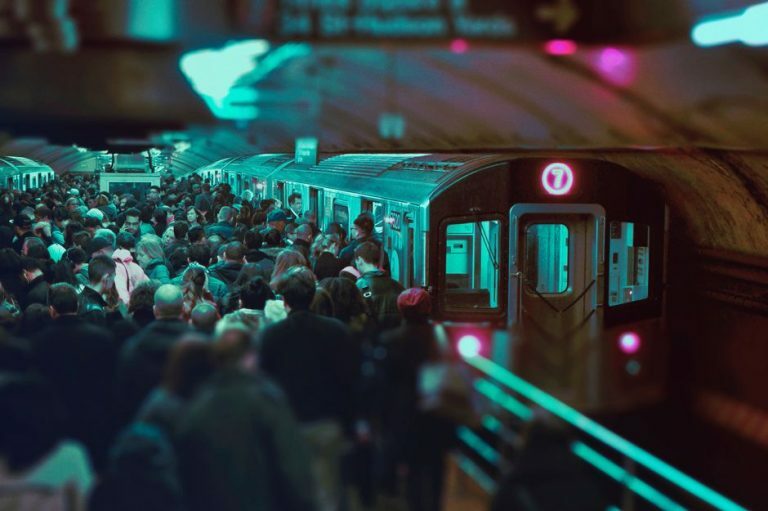 In total, New York has 472 stations and around 5.6 million daily riders. It is said that when you lay out all the NYC rail tracks, it stretches from New York to Chicago. Booth operators at the New York subway occasionally sprinkle ‘chili powder’ on the slots to prevent people from ‘token sucking’. Most subway stations are attached with green and red globes. Green globes mean the station operates 24hrs and the red globe means that the station is closed in the nights. The red globe can also mean that it is exit-only stair. There is a black and white striped board in the middle of the station to which the conductors have to point to once the train stops. This is to ensure that the train has stopped in the right place and that it is safe to open the doors. Think metro and our mind automatically brings up this cliched image of a train station crammed with people and not so good-looking exteriors. 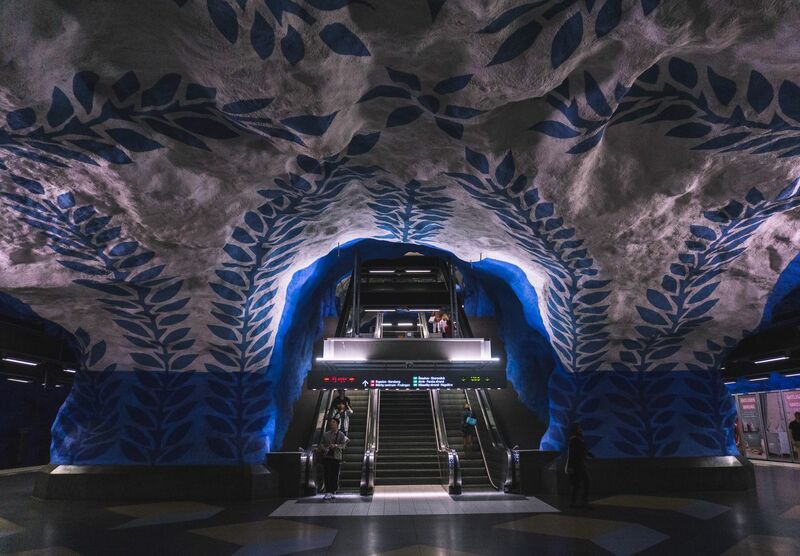 But take a look at the Stockholm metro and there is a fresh impulse of images. Images that you thought only existed in Van Gogh’s sketchbook. 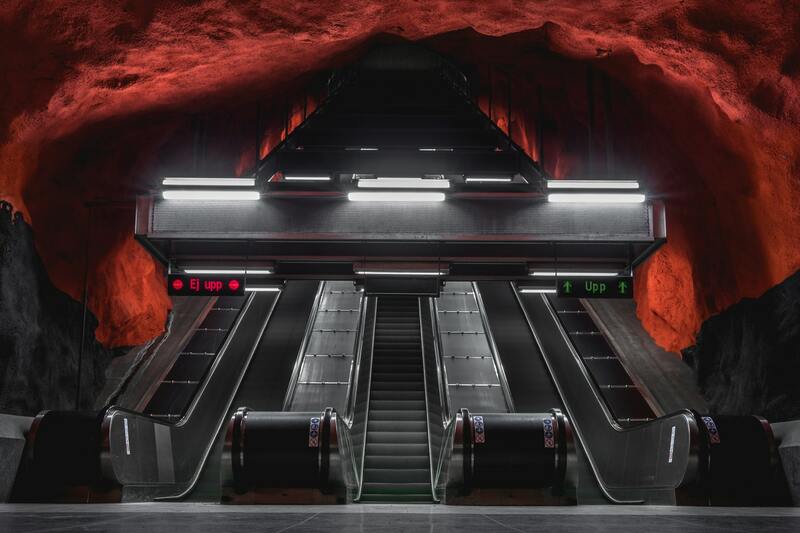 Opened only in 1950, the city has a total of 100 stations and riding on the Stockholm without a camera is a crime. 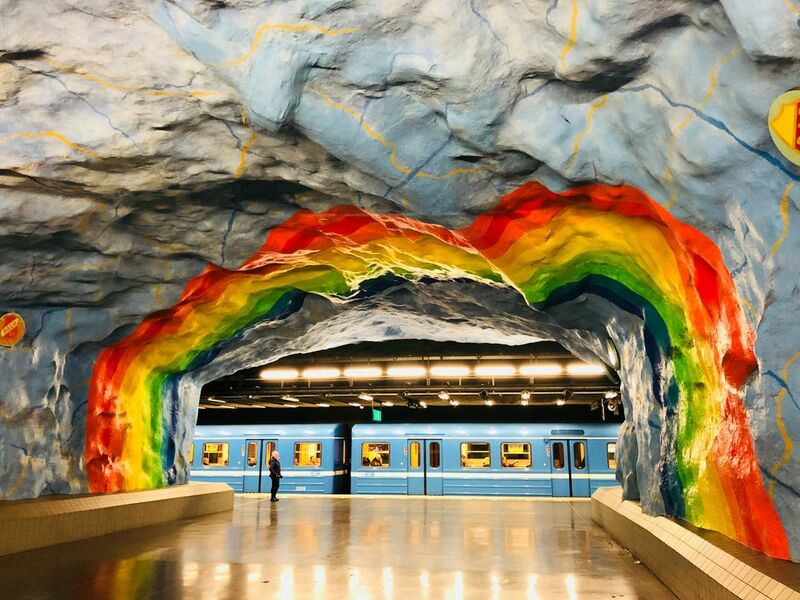 The Stockholm metro is dubbed as the ‘world’s longest art gallery’ with 90 out of its 100 stations decorated in some form of art. Have a longer wait time? There is a co-working space called the No18 Grand Central at the Stockholm Central Station. The company even calls it ‘Stockholm’s most central business lounge’. There is a room exclusively reserved at the Stockholm Central station for the members of the Royal Swedish family. Ever slipped on an oily floor? We definitely have and riding on the Hong Kong Metro is exactly the same feeling, except we don’t fall. Jokes apart, it is the smoothest ride there is. MTR, as it is referred to is also the cleanest. It is so clean that you can groom yourself just by looking at the floors. On a daily basis, over 5 million people use it. 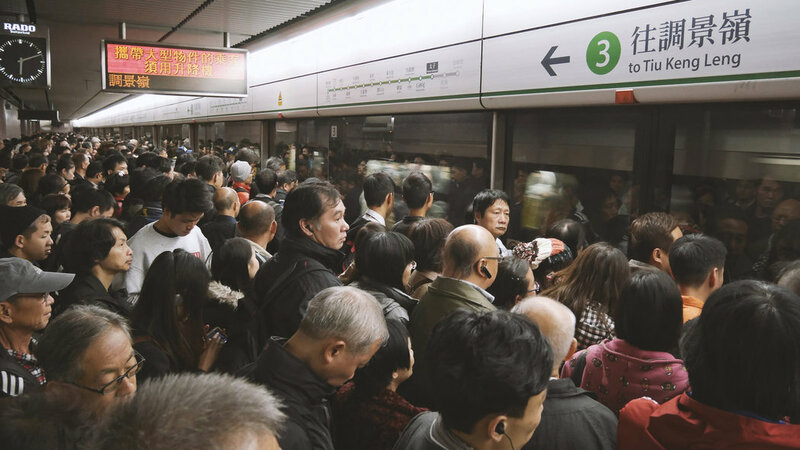 Hong Kong metro has an accuracy of 99.9% which is also referred to as the golden standard for the world metros. 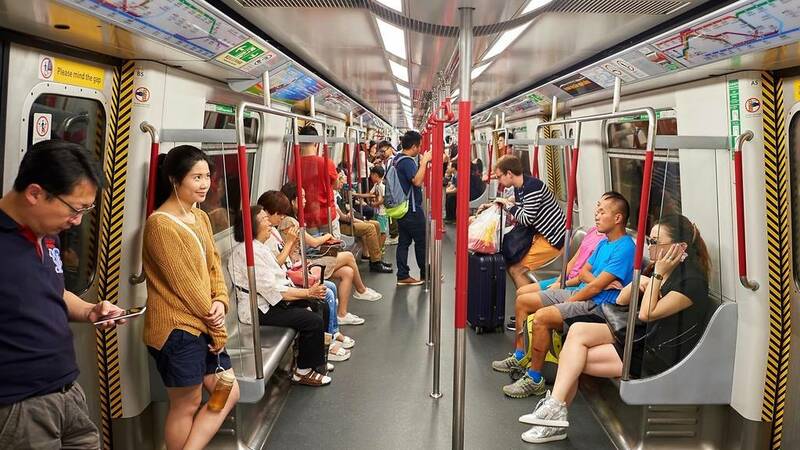 The whole of MTR is coated with an anti-bacterial coating, this includes handrails and the escalators as well. The Octopus metro card is super-convenient. It is very cheap and can be used at multiple places including gyms, restaurants, and stores. Despite running underground and underwater is some places, almost all the stations have free Wi-Fi and there is mobile coverage throughout. Fascinated yet? To ride in any of these metros, you have to be there first. So, what are you waiting for, plan a trip now! The Kingdom of Westeros from Game of Thrones is in Chicago! Meet the new face of Pickyourtrail!